Manila, 27th Nov. 204 – Bohol is moving to become the must-go destination in the Philippines as it launches new and exciting tourist attractions with rock bottom prices for airfares, hotels, resorts and tours during a travel fair to be held in Glorieta Mall in Makati City on Dec. 8-10, 2014. The three-day event is the first time ever that tourism sector in Bohol comes together in a massive campaign which is part of the Bohol Tourism Action Plan developed through the collaboration of the United States Agency for International Development through its Advancing Philippine Competitiveness Project (USAID-COMPETE), the Department of Tourism (DOT), the United Nations-World Tourism Organization (UN-WTO), and the Pacific Asia Travel Association (PATA) as well as local tourism stakeholders. AirAsia, the leading and largest low-cost carrier in Asia, is the exclusive airline partner for the campaign and will offer super low promo seats for flights from Manila to Tagbilran (Bohol). The airline that has been awarded the Skytrax’s World’s Best Low Cost Carrier for six consecutive years is also committed to offer year-round low fares for flights between Manila - Tagbilaran (Bohol) and Manila – Cebu. Promo seats are available for booking at www.airasia.com. At least 50% discount in accommodation, tours and other travel essentials in Bohol will be offered during the three-day travel fair. Boholano products will also be made available at affordable prices. The travel fair will open in a grand program featuring the world-famous Loboc Children’s Choir. The chorale group will have a nightly concert at the mall. He said the launch of the 'Behold... BOHOL' aims to promote the province as a complete tourist destination because every town has a unique tourist attraction to offer to visitors. Aside from the iconic destinations, the province is surrounded by caves, tranquil rivers, fascinating waterfalls, marine sanctuaries, mangroves and diving sites. The town is also home to the “Lamanoc Mystical Island” and is fast becoming a popular destination. Lamanoc can be reached within a two-hour drive from the capital, Tagbilaran. The island has a rich lush mangrove protecting the community from flooding, pollution and water surge. It hosts some mystical caves where ancient Boholanons bury their loved ones in jars. “The strong partnership between the local government and the private tourism stakeholders, a well-equipped manpower with innate hospitality as well as the rich natural, cultural and historical attractions of Bohol are the three main factors why we are confident to become a tourism superpower,” said Chatto. 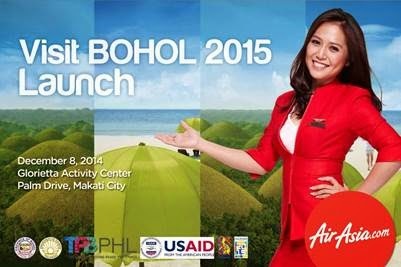 AirAsia, the Filipino Low Cost Carrier is fully supporting the ‘Behold...BOHOL’ campaign by offering its lowest possible rates for tourists visiting Bohol. It flies three times daily from Manila to Bohol.